We begin this month's issue with Part 2 of my report on the 2017 Blackjack Ball, the annual gathering of blackjack pros from around the world. (The answers to the Blackjack Ball test questions are contained in the article.) The first in a series of reports on the casinos located in downtown Las Vegas begins this month, with Stu D. Hoss reviewing the blackjack playing conditions, as well as the amenities offered to guests, at the Main Street Station and California casinos. Frank Scoblete reviews the current playing conditions in the Atlantic City casinos and provides data that show how surprisingly well the casinos did last year (their collective first increase in revenue in over a decade). Our resident blackjack pro JPB provides a fascinating overview on the " History of Kansas City Blackjack" from a card counter's perspective (don't miss reading this great article). Nicholas Colon's article explains the methodology that AP's use to avoid detection in the online gambling world and the land based casino environment. Do you have friends, family members, or co-workers that like to brag about their prowess at blackjack? 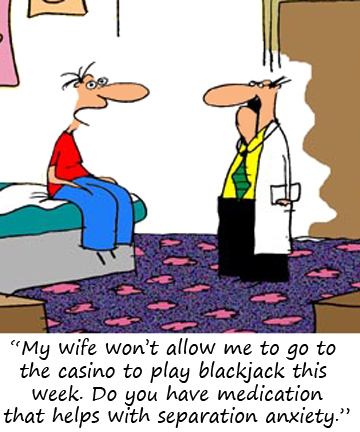 If so, ask them a few questions from my 21 Blackjack Questions article and I guarantee you will stump them. If you want to learn how a low-stakes card counter plies his trade in Las Vegas, take a gander at Barfarkel's article. You'll find one of the best articles on the current state of the Tunica casinos (with photos) in Part 5 of Jerry Stickman's series on The History of the Tunica Casinos (this is another "must read' article). Last but not least, John Grochowski answers players' questions dealing with the new electronic blackjack games; the playing strategy for Triple Double Bonus video poker; and whether or not you should bet more than the minimum on penny slot machines. What's it like to play with a real edge over the casinos? What's it like to be a David to the casinos' Goliath? Then read The Vegas Card Counting Adventures of LV Pro. This e-book will show you how skilled blackjack players beat the casinos. The Continuing Vegas Card Counting Adventures of Barfarkel. This e-book covers more of Barfarkel's card counting trips to Las Vegas and Reno over the period 2003 through 2007. You will experience what it's like to be in the trenches trying to beat the casinos at their own game. This article, which appeared in BJI #152, describes the mix of camouflage techniques that Nathaniel Tilton (and his partner) used to confuse the pit critters and afford them longer (and often more profitable) playing sessions. (Nathaniel Tilton authored the book, The Blackjack Life, a must read for wannabe and experienced card counters.) Available for purchase in the Blackjack Insider online store. "For the 21st consecutive year, Max Rubin hosted the Blackjack Ball at a secret location in Las Vegas. Read what went down at the Ball, including who was inducted into the Blackjack Hall of Fame, and the answers to the Blackjack Hall test questions..."
"It's been brought to my attention that a review of the downtown Las Vegas joints is in order. With much respect and thanks to the late Hunter S. Thompson, what you are about to read is my first steps in what I've dubbed "a savage journey to the heart of the downtown Las Vegas version of the American Dream..."
"Frank Scoblete and his team report on the latest playing conditions in the Atlantic City casinos, including the details on how the casinos did financially in 2016..."
"The possibility of casinos opening in Missouri (Kansas City and St. Louis) started appearing in the newspapers around 1991. Approval required a state-wide vote that was very close and required some concessions by the casino industry. Among the unique concessions were..."
"Once again the hour arrived to start my drive for a five-day blackjack trip to Las Vegas. I was meeting The Grifter and some temporary investor/players he'd lined up for a joint-bankroll team, and..."
"In this article I'll cover the methodology for avoiding detection in the online gambling world and the land based casino environment..."
STICKMAN'S STANCE: THE HISTORY OF THE TUNICA CASINOS-Part 5 by Jerry "Stickman"
"This final installment of the history of Tunica casinos contains a look at current casino conditions in Tunica County and..."
"John Grochowski answers readers' question dealing with the new electronic blackjack games; the playing strategy for Triple Double Bonus video poker poker; and whther or not you should bet more than the minimum on penny slot machines..."
"The next time you belly up to the bar with a friend or co-worker who thinks he knows everything about the game of blackjack, ask Mr. Know-It-All a few of these questions..."